This little amigurumi bear is fast to crochet and a great way to use up your odds and ends of yarn. 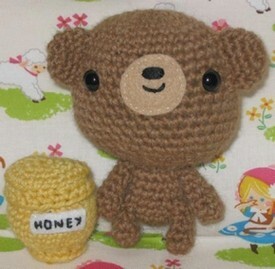 He even comes with his own crocheted honey pot. Bind off, weave in loose end. Bind off leaving long tail for sewing, sew to head. Bind off leaving long tail for sewing, stuff and sew to head. Bind off, leaving long tail for sewing and sew to body (no need to stuff them). This work is licensed by Creative Commons Attribution-Noncommercial-No Derivative Works 3.0 Unported.